I’ve been reading your blog for many months and it has been comforting to know that so many others have trouble getting well after a sesamoid injury. It seems everyone’s story – like mine – has many twists and turns and failed attempts at pain relief. I would not be writing you if I were not at my wits end. Let me preface my story with saying that I am extremely active and physically fit. I regularly (at least weekly) swim 30 laps, hike 10 or more miles, bike 10 or more miles, play tennis or racquetball, take 2-3 pilates and yoga classes per week, lift weights, do yardwork/landscaping, house repairs, etc. I am about 5’ 3”, weigh about 120-130 lbs, female, and although I am currently in my 50’s, I can out-do any 35-year-old. Since so much of my life revolves around an active lifestyle, you can imagine how devastating it is to have my whole world changed by a foot injury. I have never had any foot or leg injuries before, and am in good health, take vitamins (Calcium, D, multi, fish oil, baby aspirin, etc. ), and take no prescription medications other than an estrogen patch (for hormone replacement post-menopause). Dr Blake's comment: You are a great example of cross training to vary stresses we put on our bodies. On October 2, 2016, I was doing yardwork and had a set of long pruning shears hit my foot. Immediately I could feel my foot (around the big toe area) swell up inside my shoes (sneakers) and I knew by the amount of pain it was bad – very bad. Nevertheless, I had to finish the yardwork because I was getting ready to show the house the next day (in the process of selling it), so I pressed on without icing it right away. After doing yardwork I took a hot shower, and it swelled further and became more painful. So it was only many hours after the injury that I started icing it. I thought it was a broken toe and since there is nothing to do for that really, I did not seek professional help. A week later, when I still could not walk in a regular shoe, I made an appointment with a podiatrist, but the first opening was not until October 17, so I had been walking on my foot for 15 days before I had an x-ray which showed a broken sesamoid bone. He put me in a walking boot which came up to my knee and showed me how to make the “L” shaped pad to affix to my foot underneath. After a week, my ankle began to swell and the walking boot became uncomfortable, requiring I have my leg elevated most of the day. 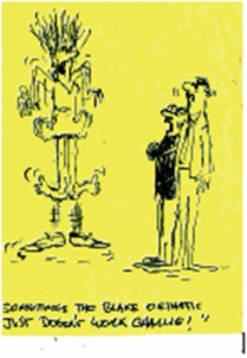 He prescribed compression stockings. The compression stockings increased the pain, and after a week, I quit using them. Dr Blake's comment: We call this vaso-motor insufficiency, when the protective nerves cause too much discomfort. The body rushes in fluid to heal something, but it is only the nerves screaming that is causing the pain. It is an over reaction to the injury that involves the sympathetic nervous system, but it makes the pain terrible. November 2016: I began using a knee walker “scooter” at work (I’m a medical writer). However, I could not use the scooter at home because of the stairs (my house was on 3-levels). I was walking in the boot (or slipper) while at home. I began working from home part-time, and due to the impending sale of my house, I was packing (requiring being on my feet a lot), and searching for a new place to live (requiring being on my feet a lot)… most of the time in the boot. The pain was bad enough to require icing it down daily. I experimented with a small boot (that only came up to the ankle) but that was much worse. Dr Blake's comment: I am not sure why 2 or 3 of those scooters can not be dispensed at the beginning. So many patients complain of the same thing. They need a scooter at home, at work, and one in the trunk of their car. The larger the boot, the less tight around the ankle it has to be, since it has a bigger area to grab your leg. The smaller ones only have the velcro down by the ankle to crank down on. Unfortunately, this is all usual stuff with easy cures. December 2016: The foot pain was getting worse and ice no longer helped. I had a car accident which totaled by car, so now, on top of packing and moving, I also had to start car shopping and test-driving cars. An MRI at end of December showed the bone still had not healed and there was significant bone marrow edema in the medial sesamoid. Dr Blake's comment: The MRI is going to be hot for a year or so. I like to wait 6 months between MRIs and definitely get a comparison of the two done. At some point, the hypersensitivity of the nerves really started going. Nerves hate ice and like warmth, gentle motion, gentle massage, no prolonged stretching, etc. January 2017: I was moved, unpacked, lost my job, and was finally able to stay off my foot, and use the scooter in my new house (no stairs). After 6 weeks of total rest, an x-ray showed no healing of the fracture. Indeed the pain was still as severe as it was the initial day I hurt it. I experimented with creating home-made orthotics inside the boot. I tried applying heat (heating pad) because ice was no longer helping. Dr Blake's comment: Xrays are poor at showing the internally healing, and you have to go mainly on the pain. In your case, that was not helping us either. February, 2017: I purchased an Exogen bone stimulator (low-intensity pulsed ultrasound) and have been using it twice per day for 20 minutes each time, beginning mid-Feb. (a total of 93 days now). Because I was in the boot for so long, I developed plantar fasciitis, which was even more painful than the sesamoid! I also began having knee and hip/back pain due to the altered weight-bearing, and multiple bruises on my leg from using the knee walker. I started physical therapy 2-3 times per week, with the goal to increase circulation in my foot. Since I was still non-weight-bearing, the exercises I could do were limited: ankle and toe calisthenics. Although the exercises hurt at first, I did them and gained excellent flexibility and range of motion. The physical therapist also used deep tissue ultrasound and taping for my plantar fasciitis. I had a custom orthotic made (they took a mold of my foot), but it was many weeks before I received it due to insurance snafus. After being totally away from all exercise since my injury, I began swimming again, and worked up to my “usual” 30 laps each week. Initially, it was hard, with lots of foot cramps and stopping, but it got progressively better. In an effort to find some reason why the bone was not healing, I had a bone density scan to rule out osteoporosis, and a Vitamin D3 test, which both came back normal. Dr Blake's comment: You are doing all the right things. The pain can intensify with limited weight bearing due to fluid buildup and nerve hypersensitivity. I hope the sesamoid is hurting because of that and not lack of healing. I came across an article (https://www.ncbi.nlm.nih.gov/pubmed/12463658) that described inserting a screw into the sesamoid (to hold the broken pieces together) which obtained excellent results, and I sought about trying to find someone who does this procedure. I consulted with 3 different doctors, and all said no one in the U.S. does this procedure (the research for the article had been done in Australia). I was told about one orthopedic surgeon in NC who tried an open (not percutaneous) screw fixation procedure years ago and had bad results, so stopped. March, 2017: I consulted with an orthopedic surgeon who said the quicker I get into a “regular shoe” with an orthotic and out of the boot, the quicker all my plantar fasciitis, knee, hip, and back problems would improve. He was right. I wish this would be widely known and become the standard of care in medicine. I feel I endured much more pain, discomfort, decreased mobility, and harm to other parts of my body needlessly. On the advice of the orthotic maker (who also makes custom prosthetics for amputees), I purchased a pair of New Balance sneakers a size larger than normal and an extra wide width, and the orthotic was fitted to it. The purpose of the orthotic was to push the weight to the outside of the foot and force me to walk “unnaturally” so as to alleviate pressure on the sesamoid. A “regular” insole was put in the right shoe (good foot) so I could wear the same pair (both feet) and be level. I returned to doing as much exercise as I could: weight-lifting, pilates, swimming. Dr Blake's comment: I do also. And I am sorry, but old rules sometimes never die. Many readers will benefit from your wonderful descriptions. The orthopedic surgeon told me the objective should not be to get the two broken pieces of sesamoid bone to unite, but rather to walk without pain. He explained that many people have a bipartite sesamoid and do just fine. Both he and the podiatrist told me if I still cannot walk after 12 months, that they would remove the bones – both broken pieces. I found articles on using platelet-rich plasma injections for helping to heal broken bones, and looked into that. Unfortunately, my insurance would not cover these and they are $700 each. Also, my podiatrist said although he has had good results with PRP for wound healing, he said the probability it would help for a broken sesamoid is extremely low. What is your opinion on PRP? I found a doctor who not only does PRP but also amniotic membrane injections, and injections of stem cells made from your own fat cells. All of these things are considered experimental and so are not covered by insurance. However, at this point I am willing to try anything! But for what the cost of these injections would be, I could probably fly to Australia and have the screw fixation! Dr Blake's comment: They are experimental. Patients flood my office after unsuccessful PRP or stem cell injections for another opinion, but I am sure I do not see the successes. Limited and biased experience. I totally disagree with not letting them unite!! And, I totally disagree allowing you to walk on the outside of your foot (called supination). I can name you 20 injuries or pain syndromes at least caused by this abnormal walking. You need the weight through the first and 2nd mets, evenly, not the 4th and 5th metatarsals. April, 2017: Because the orthotic was causing me to walk unnaturally, I now developed ankle and knee issues, and had to return to the orthotic maker for revisions of the orthotic twice. After the second revision still did not making any sustained walking possible, he suggested I purchase a pair of Hoka One One shoes (still a size larger and extra wide), which I did. They have been a big improvement, and I noticed you also recommended them in your blog. I continued experimenting with making my own orthotic in it. I found that I could bike with less pain than I could walk, so I went biking when I could. But still, the amount of walking needed to load the bike rack on the car, etc., was painful. Keep in mind that all this time, I am still having to use the knee scooter when doing grocery shopping, and even getting in and out of the pool in the gym. In other words, I still cannot walk more than about 3-4 steps without pain, and still having to elevate it at various times throughout the day (hurts to keep it down too long) and also still needing to ice it down occasionally (especially after bike riding!). May, 2017: After 93 days of using the Exogen bone stimulator, I had an x-ray which showed the sesamoid looking EXACTLY the same as it did in my original x-ray from October – not the slightest bit of healing. Up until this time, I resisted getting a steroid shot, because steroids are known to inhibit bone growth. But now I figured, it doesn’t look like the bone is ever going to grow, so I might as well. What is your opinion about steroid shots? Dr Blake's comment: No, not in a joint that is trying, even though unsuccessfully, to heal a fracture. With the bone looking the same, impossible for a fracture due to bone remodeling, the whole cause of your pain is in question. You really do not know if this is fractured. Your original injury could have jammed a congenitally bipartite sesamoid against the ground bruising it. The 2 pieces will have look like they are coming together. Was the bottom of the metatarsal where it hits the sesamoid also injured? A repeat MRI will help. The podiatrist is concerned, as am I, that my pain level is way out of whack for a typical broken sesamoid, now 7 months later. I wondered whether we were missing something, like a torn tendon or joint problem, but he said any problems like that would have shown up in the MRI and didn’t. He suggested I may have nerve damage and should see a pain management specialist. From what I know about nerve pain in feet, I do not have those kinds of symptoms (like tingling, numbness, “pins and needles”, etc. ), so I am not convinced of that. However, it could be that in the injury I had with the yard implement, I damaged the nerve and that was the problem all along… that perhaps the broken sesamoid was an existing condition (for example, an injury I sustained in childhood and forgot about because it was never diagnosed or treated?). What is your opinion? Would you treat this as a nerve injury at this point? What types of therapies or diagnostic measures would you recommend? I am afraid of getting the sesamoid removed only to find out that was not the source of my pain. Should I abandon the bone stimulator altogether? My podiatrist said I might as well stop using it because it obviously is not helping. Dr Blake's comment: Sounds like you are on to something. And yes, typically broken sesamoids can be walked on with removable boots and dancer's pads within the first month of treatment as the inflammation goes down. Look at all the possible sources of pain. Are we sure the MRI, and you are due for a 6 month comparison one right now, did not show anything else. 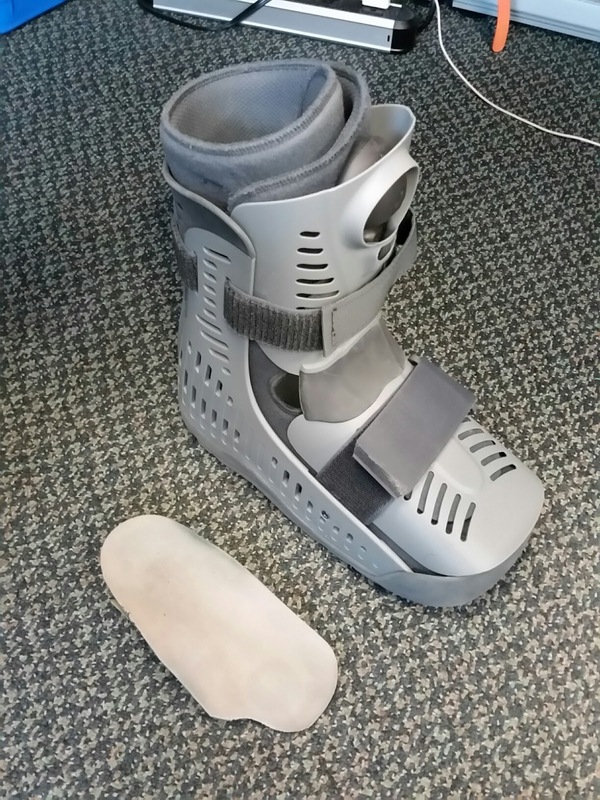 Limited weight bearing in a boot with a dancer's pad will not hurt your foot (and you can use crutches) and may begin to add tone and circulation back into your foot. A pain guy should be versed in nerve hypersensitivity and know what creams, pills, TENS units, etc will help the nerve. Sounds like the orthotic guy is skilled, so keep pushing him to make you something you can walk with. I would love to see a photo of an xray at least that shows, but I will be out of the office until 6/13, so I am rushing at least to get this done. As you can imagine, after 7 months and getting no pain relief, still unable to walk more than a couple of steps, cannot wear “normal” shoes, and dealing with lots of crap from insurance companies (I wound up paying 100% out-of-pocket for my scooter, bone stimulator, and orthotics), I am frustrated and tired. Any ideas, suggestions, or comments you have would be greatly appreciated and heartily welcomed. Dr Blake's comment: I think we are ending this communication with the impression that you may not have a fracture at all, you are treating this with limited weight bearing that greatly increases pain (not decreases pain) in most people by allowing the normal weight to push abnormal fluid out of the area, and allow nerves to get hypersensitive. It is impossible for a healing fracture to look the same on xray, but what is going on. Please let me know mid June if you have found something out. The Steph Curry Ankle Brace: 2 MVPs and 2 Championship so far!! One of my kind patients sent me the link on the famous Stephen Curry ankle brace!! Give it a try or leave your comments below this post! Sale now for next years winter boots! A patient recommended these for comfort and stability, especially around the house. Thought I would pass it along. I have been using Hike and Bike shoes to immobilize the foot while not having the negative impact of a removable cast in some patients. There is one used in a plantar fascial tear for the 3 months I normally cast the foot with a removable boot. If the patient especially has a back problem, the evenness of wearing a pair of shoes like these can be great. Remember you are not able to bend your foot in push off, or it will hurt you. Therefore, it immobilizes the pull of the plantar fascia. Any metatarsal problem could be helped by this, even if it is only part of your treatment to vary the stresses 2-4 hours a day. Sesamoid problems, turf toe, metatarsalgia or stress fractures may be helped. I am a 41-year-old single mom of two very active boys ages nine and eight. In April, I walked right off of a pedestrian sidewalk not realizing it had ended and landed right on top of and rolled my foot and ankle. 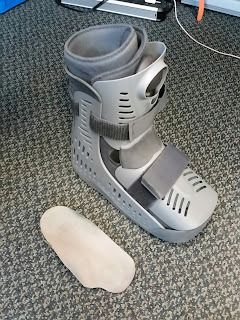 I have been in one of the immobile walking boot since 4/17. They elected not to cast immediately due to an open wound. The fracture was only visualized on the lateral x-ray. Was not until we got the CT scan that we realize the extent of the injury. What do you feel is my best option? The doctor feels a compression screw to attach the two pieces or six weeks in a hard cast at this point. I continue to use KT tape as well as lidocaine patches. I am in active as I can be given my current situation. If I do get out of the house I remove my boot each time I drive and also use the knee scooter when there are long distances to travel. All of you that have been reading this blog for awhile know my non-surgical bias. Personally, I had a bad ankle sprain 38 years that supposedly needed an operation, a herniated disc at L2/3 13 years ago that needed an operation, and torn meniscus in my right knee that needed an operation. All of these I successfully rehabbed and returned to my full activities. In practice, I see some ankle fractures that really do not need to be fixed, achilles tendons that do not need to be repaired surgically, bunions and neuromas that could get better without surgery, and tarsal tunnels that need some good nerve treatment and a supportive orthotic device. All I can say is get opinions, try alternatives as long as they are safe, do the best you can do to help (to try to avoid rotator cuff repair I am doing up to 2 hours of exercise a day now and it is working!!). I am usually one who just does one thing. I hike to count my steps or I play basketball 3 days a week, or I run 20 miles a week, but while I am doing one activity I tend to not do any others with any routine. I hope this article convinces you, like me, to cross train more with all it's benefits. I hope you are well and thank you for your great book, blog and guidance that have been instrumental during this challenging time. I have seen a few doctors and have felt that your book and blog were the most informative and caring/humane and that is why I am reaching out to you desperately at this critical point in my life. It would mean the world if you can let me know your thoughts, insight and valuable advice, and of course this can be shared on your blog to benefit everyone. - Increasing pain, saw doctor few months later in 2017, X-Ray Feb 25 (attached): Left medial sesamoid fracture. Dr Blake's comment: After all the walking you did not knowing you had a fracture, the fracture fragments are together, so it is not considered unstable. Some believe in non weight bearing for a time to let fragile bone elements get stronger, a theory, but I also find that the bone demineralization and swelling build up from non weight bearing which may cause 3 months of soreness for 6 weeks off the ground. Then, after the 6 weeks, it is hard to evaluate the symptoms accurately. - Used to wear Dr. Scholl's flat feet soft orthotics in regular shoes, and the person that provided me with the boot attached a rubbery material to harden/lift the arch even more and cut out the part under the sesamoid so that it floats (image attached). - MRI Taken on April 16 (after ~3.5 weeks in NWB). I would like to bring my sesamoid bone back to life if possible without aggravating the fracture and hopefully healing it at as well and getting back to normal active life. Based on reading your book/blog, here are my proposed next steps and please let me know if you would prefer any alteration/addition. - Ordered Exogen bone stimulator to start asap, 3x day: morning, lunch, evening. Dr Blake's comment: Twice daily fine! Dr Blake's comment: Start with 1 min hot and 1 min cold alternating each for a total of 20 minutes each evening. As you feel better, see if you can progress to 2 hot 1 cold for 18 minutes without feeling like the joint is getting stiffer. Dr Blake's comment: Excellent, definitely can not hurt yourself with moving your toes on your own. Don't forget using oil or gel to massage your foot for 2 minutes three times a day to de-sensitize the nerve over-reaction of protection. - 1 week partial weight bearing in boot w/ help of crutches, then get Evenup for other foot and walk in boot. Dr Blake's comment: Get some 1/4 inch adhesive felt (moore medical) and make a dancer's pad for the foot of one or two layers to float the sesamoid some. - Do I have a good chance? Dr Blake's comment: For sure. One of my concerns is the plantar plate tear. Did you have a fall, the only way to tear at your age, or is this an other read? It will take 9 months or bone stimulation, contrasts, good bone health, and keeping the pain level between 0-2 in the healing range. You have to be willing to take the sesamoid out if it does not work, and it can take one year or so to figure it out. May need some help from friends to keep you focused. Have a surgeon picked out in your mind, but vow internally that you are going to prove you will not use their help. This is what I would do for myself. - Do I take any blood thinners to help blood flow for AVN, ex: aspirin? Dr Blake's comment: Never heard of that research, so probably not. - I do not see swelling or feel pain (unless I press w.finger on sesamoid there is some). Do I need to ice? Not sure what is best given AVN and want to promote blood flow. If iceing then how long and freq. please? Dr Blake's comment: Icing gets a bad wrap on stopping blood flow, which is only temporarily. Read about Hunting Phenomenon below. 5-10 minutes is all you need to quiet the inflammatory aspect twice daily. - Contrast baths, do I end with hot water to promote vasodilation? Dr Blake's comment: No, always end with 1 minute of ice. Hopefully, the 2 articles above will help you understand icing or cyrotherapy better. - Spica taping? Any other foot or toe limiting movements I should apply? Dr Blake's comments: If I ask 20 patients with this problem what is crucial, there would be 4 distinct camps. 5 would say spica taping is crucial, 5 would say Cluffy Wedges are crucial, 10 would say dancer's padding is crucial, 5 would say custom orthotics are crucial. Just got to try everything to see what is crucial for you. Dr Blake's comment: Typically nothing is needed. Dr Blake's comment: We have to avoid impact stress, like jumping down hard, or forceful push off, but moving of the toes, ankles, knees, and most exercises can be slightly modified to take pressure off (like dropping your sesamoid into a hole made of four books so you can do balancing or stretches, or putting the weight in the arch with the pedal when stationary biking). Just listen to your body. But we need motion, some weight bearing, strength, cardio, etc. - When sleeping do I elevate foot on a pillow or does it press on calf muscle and limit blood supply? Dr Blake' s comment: It depends how it feels in the morning. Swelling up or down. If down, no need to do anything. If up, try books between the boxstrings and mattress at the foot of your bed, and gradually raise up. Try 1 inch to start. - I am wearing a thin dancer's pad as well stuck to foot, do I keep that on? Dr Blake's comment: Yes, you will be wearing dancer's pads for a long time. Typically, people can figure out how to attach it to the shoe or shoe insert. Here is where you buy a roll of the 1/8th inch adhesive felt to make your own. - Would I do Exogen before or after the following: icing, contrast bath, PT, exercise? Any particular order you would recommend for all these to make sure I promote blood flow and healing? Dr Blake's comment: Icing after you do walking or exercises that you think may irritate things. Contrast baths usually in the evening as a deep flush to daily move out the swelling trapped in there. Exogen twice typically early am and before bed. - Massaging foot? just pressing hands (and on sesamoid too?) or shall I get a foot roller (any recommendations?)? Dr Blake's comment: At this point, I would gradually increase pressure with your 2-3 times daily sesamoid and total foot massage just with your palms. You will have to go lightly around the sesamoid at first, but it is vital to de-sensitize the nerves to be right on the sesamoid area. - Cluffy wedge for now or later down the line or not needed? Dr Blake's comment: Now, and as long as need that protection. Sometimes, it is hard to tell initially, but so many of my sesamoid sufferers swear by it. It may be more important when you are taking more normal steps. - How long in boot before transitioning to post-op shoe, then how long after that to hard-soled shoe? If I insert carbon graphite inserts in my regular shoes, will these be too harsh on sesamoids? If not when can I do that? Dr Blake's comment: The post op shoe is if you can not take any weight transfer onto the sesamoid, so that can be first or never. The boot, with an built in dancer's pad (sometimes up to 1/2 inch float, is more the starting point. Hard soled shoes can be a long time away, with soft soles (like Hoka One One with a Rocker, or Altra Olympus with just cush and zero heel height (drop)). There is a lot of experimenting that can be done as you begin to get comfortable walking in the boot, and you know on the horizon as shoes. Get familiar with Road Runner Sports and Zappos. These are online places with great policies on shipping and returns. - Boot is large, shall I bike in socks and put weight on arch/heel, or bike in post-op shoe at this stage? Dr Blake's comment: Start with weight on heel initially, and after 5 times, and if you are feeling good with that, try a few times with the weight in the arch. As the weight goes into the arch, there is a little more pull on the tissue that attaches to the sesamoid. You can not hurt it, but the extra pull may be irritative right now. - Is Evenup high enough to balance other side of body? Purchasing one right away as already feeling a little hip aching? Dr Blake's comment: Yes, there are 2 parts to the EvenUp, and one can be removed if the EvenUp is too high initially. Women typically have little problem finding a shoe with the correct heel height. More struggle for men. - When would I start acupuncture vs dry needling? which one? Dr Blake's comment: Technically, they are the same, although many practitioners separate the nerve part and the muscle part. It is up to the skill and purpose of the practitioner. I always feel acupuncture is one of the best ways at increasing blood flow, increasing our body's own immune system, and desensitizing nerves. So, if given a choice, I tend to recommend acupuncture. Dry needling, is really acupuncture, but used for muscles more I think. - X-ray followups how often roughly? F/up MRI in 3 months? CT scan? Dr Blake's comment: I would get a CT scan now to get the bone health. I would get a followup MRI 6 months after the first one to check progress. Any other advice or your usual inspirational words would help a lot and I really appreciate your valuable insight and support during this difficult time. You're a life-saver, sorry for the long email and thank you from the bottom of my heart. Dr Blake's comment: I looked at the MRI he sent by Google Drive, pretty cool that it can be done that way, and saw massive joint swelling which can wash out the visualization of the ligaments (so I emailed him to get a feel if there was any chance he could have torn his plantar plate). You could definitely see the sesamoid fracture with healing edema. Thank you very much for looking into it Dr. Blake. No high impact activities or falls. First time I had ever felt some minor pain in this area was a few years ago after walking around for a few hours in the city wearing very thin shoes. Following that long walk, I had on and off pain every now and then in both feet, more prominent in the left. I also think I might have not be walking correctly since I had sprained my left ankle several years back and was advised by a physiotherapy student/friend to put my weight on the area under the big toe while walking. I have very flat feet and overpronation naturally though and have been wearing the Dr.Scholl's OTC orthotics pictured in my original email. I used to play a lot of soccer but haven't been playing for over a year. Before NWB I was going regularly to the gym to workout (5x per week): lift weights and bike, eliptical and run on the treadmill (~10 minutes each at high speed). The night before the day I got the sharp sudden pain (fracture I believe) I was squatting a little heavier than I usually do at the gym, not very heavy weights though around a total of 160 pounds. I was healthy and eating well with a daily Centrum multivitamin and at least a glass of milk a day. It was winter and I would probably go weeks with no sunlight at all though (work indoors most of the day and cold and cloudy weekends usually). It was around Christmas and I had received winter boots as a gift and they were actually pretty tight on my toes, and the sudden sharp pain (fracture) hit me while wearing these after wearing them for about a week. Thanks again for asking and that's all I can think of.